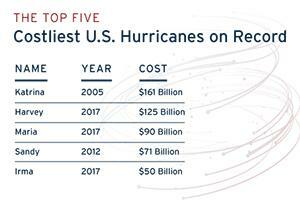 Natural disasters in 2017 caused over $306 billion in damages in the US, making it the most expensive year on record (1). The death toll in Puerto Rico alone stands at 2,975 (2). FEMA’s capability to provide support to Puerto Rico was already stretched thin by its efforts to respond to Hurricanes Harvey and Irma, the massive wildfires in California, and the other 689 federally declared disasters in 2017. FEMA was reported to be overwhelmed, understaffed, and ill-prepared to handle the most devastating and costly year of natural disasters the United States has ever seen, most notably by NPR and PBS Frontline. A new tool could modernize disaster relief which will ultimately save lives: blockchain. Blockchain (3) is best known for its use as the underlying technology for Bitcoin, but it has a much wider breadth of application than cryptocurrency. Currently, there are several blockchain use cases for the disaster relief space, including: to monitor, track, and pay for supplies; to streamline identifying available beds, supplies, and medical care; and to create a secure donation system with internal audits to prevent fraud. This article proposes in particular using blockchain to systematically vet contracted suppliers by awarding contracts in a safe, fair, transparent, and efficient way with the use of smart contracts. A smart contract is a computer code running on top of blockchain technology that contains a set of rules under which occupants of the chain agree to interact with each other. Only if the rules of the agreement have been met will the automatic enforcement of the contract be executed. Blockchain technology can also be used to implement a more trusted and transparent process to order and reorder distributed supplies to maintain full warehouses, avoiding the delays seen with the response to Hurricane Maria in Puerto Rico. If FEMA and its ecosystem of disaster relief partners had a system to manage and control supplies and contracted support, aid would reach the victims of disasters in a much quicker fashion than is currently available, affecting their well-being and potentially saving their lives. In 2017, FEMA awarded a series of problematic contracts that had devastating consequences for Puerto Rico after Hurricane Maria. 30 million meals were needed in Puerto Rico and the $156 million contract was awarded to Tiffany Brown, the sole employee of Tribute Contracting, LLC. Ms. Brown is “an Atlanta entrepreneur who had no experience in large-scale disaster relief and had at least five previous cancelled government contracts" (5). When 18.5 million meals were due, only 50,000 were provided and they were packaged incorrectly, rendering them useless. As reported by Bloomberg, FEMA had chosen to side step the competitive bidding process in lieu of a faster award process to compensate for the intensity and proximity of the hurricanes (6). The significance of this concern cannot be understated as an example; over $2 billion in contracts were awarded just between August 25 and September 30 in 2017. Other questionable contracts include: 1) a $30 million contract to Bronze Star, LLC, for temporary roofing materials in Puerto Rico that were never delivered; and 2) a $300 million contract to Whitefish Energy to rebuild the power grid in Puerto Rico, which FEMA later cancelled. With blockchain smart contracts, FEMA could determine which bids are reviewed based on predetermined rules such as if the contractor has experience in large-scale disaster relief work; has had any previously cancelled government contracts; has provided a technically acceptable bid; and has followed all federally mandated procurement standards. This process can be done in a matter of seconds through a blockchain platform, providing FEMA with a much-needed tool when responding to a disaster: speed. With Hurricane Irma hitting only two weeks before Hurricane Maria, many of FEMA’s (and its partners’) storehouses were severely depleted and it took days for the first barge of food and water to reach Puerto Rico (7). Creating a culture of supply readiness across the disaster relief ecosystem will mitigate many compounding issues that stem from unpreparedness. Blockchain can significantly assist in FEMA and its partners’ operations by not only tracing and tracking the supply acquisition and distribution to their ultimate destination, but also by establishing a smart contract mechanism to automate (and if forecasting suggests, advance) the reordering of any required supplies. This would allow FEMA to support victims with increased efficiency and effectiveness in the wake of a natural disaster. The next steps for disaster relief organizations who are looking to implement blockchain technology are to: 1) learn as much about the technology as possible; 2) research and examine other pilot programs; and 3) pilot small programs internally. Creating a prototype and implementing feedback will help facilitate the conversation at an organizational level. Ultimately, modernizing the disaster relief system will save lives, improve resource allocation, and save money; which means even more victims can be supported. Systematic change can happen and lives can be saved; all it takes to start is a little re-imagination of a ledger. (3) A blockchain is an immutable and encrypted ledger system that is distributed across a decentralized network of independent computers which update in near real time. The beauty of a distributed ledger system is that it allows for each user to prove the record is uncorrupted and was accepted by the majority to be accurate.